Can Maran brothers save their business from on-going siege? The Marans' business empire is under siege. Will they be able to save it? The MM Towers in the tony neighbourhood of MRC Nagar in Chennai hosts one of India's most powerful media companies. With its high walls, omnipresent security personnel and cameras watching the entry and exit of every individual, the headquarters of the Sun Group looks like a fortress being defended from an attack. The threat, though, is not from competitors but from the country's current political alignments. At its peak, the group was a Rs 10,000-crore giant that dominated media business in South India with its TV channels and cable/DTH business. With its 48 FM channels across the country, two daily newspapers, five magazines, an IPL franchise (SunRisers Hyderabad) and the airline, SpiceJet, it was one of the fastest-growing business groups south of the Vindhyas. However, it started losing out when DMK patriarch K. Karunanidhi - the grand uncle of owner Kalanithi Maran - was defeated in the 2011 state elections. Then, in 2014, the UPA, of which the DMK was a key member, was defeated, further eroding the group's influence. The empire, built over the past two-and-a-half decades, is now beginning to crumble. First, lack of support from state-run lenders forced Maran to sell the struggling SpiceJet to Ajay Singh, who is credited with the BJP's Achhe Din pitch in the 2014 elections. In fact, Singh had earlier sold SpiceJet to Maran in 2010. This pulled down the group's turnover from Rs 10,000 crore to Rs 4,000 crore. Now, Sun TV, the Rs 2,331-crore TV business, is also being threatened. In the first week of June, there were reports that the Ministry of Home Affairs (MHA) had recommended to the Ministry of Information & Broadcasting that TV licences of the Sun Group be revoked due to "economic security interests". The threat, if carried out, will hit Maran where it hurts the most, for Sun TV is one of India's most profitable media entities and the group's cash cow. In all five southern states, except Kerala, Sun TV Network channels - Sun TV, Udaya TV, Gemini TV - are market leaders in the general entertainment category. The MHA has also denied security clearance to FM channels owned by the group. The Centre had also withdrawn the Multi System Operator licence to Kal Cables, owned by the Maran family, though the company has got relief on this from the Madras High Court. The assaults, including the earlier Enforcement Directorate notices for attaching more than Rs 750 crore assets owned by him and his brother, have the potential to cripple Sun's empire. At a personal level, the Central Bureau of Investigation (CBI) is already probing Kalanithi Maran and his brother, former Union minister Dayanidhi Maran, in a number of cases, including illegal use of a BSNL exchange installed at their residence. Dayanidhi has also been charged in the 2G spectrum allocation case. The Group Chief Financial Officer (CFO) of the Sun Group, S.L. Narayanan, says he was shocked when he heard about the latest MHA move and rushed to Delhi to meet officials and understand their concerns. "Nobody in this government wants to meet us. This has never been the case. In the past they might not have agreed with you but they would meet you," says Narayanan. The issues Sun TV is facing are unique. This is because its fortunes are intertwined with the political associations of the promoter family. Therefore, it is important to look at these linkages and Kalanithi's early days to understand the challenges it is facing. Hansraj Saxena, a college mate of Kalanithi at Chennai's Loyola College who later worked in a senior position at the Sun Group, remembers him as an above average student. Saxena had campaigned for Kalanithi when he ran for and won the presidentship of the students' union. It helped that he came from a pre-eminent political family. For Kalanithi's grandmother, Shanmuga Sundari, had brought up not only her son, Murasoli Maran, but also her brother, M. Karunanidhi. While Karunanidhi was known as Kalaignar (artist), Kalanithi's father was a man of letters, running the party newspaper, Murasoli. By the time Kalanithi graduated with a commerce degree and went to do MBA from the University of Scranton in the US, his grand uncle had been the chief minister of Tamil Nadu for a few terms. The father, too, was a Member of Parliament. The family also ran a few publications under Sumangali Publications. After returning from the US in 1988, for two years, Kalanithi learnt the ropes of the media business and ran Poomalai, a video magazine on the lines of Newstrack, before deciding to enter the television business. He launched Sun TV in 1993. Kalanithi realised early on in his TV career that original programming was expensive. So, Sun TV bought TV rights for a large number of regional movies. Also, while others commissioned programmes, telecast them and earned from advertising, he turned the model upside down. Anyone could buy a slot on Sun TV and telecast content by paying a fee. This meant Sun did not have to hire people for programming and selling advertising time. "This looks like a no-brainer. However, Kalanithi pioneered it in India. He converted his weakness, lack of 'formal' capital, into strength," says a former employee of Sun TV who did not wish to be identified. Getting a transponder and programming is only the first step in the business. The next, setting up a distribution network, is more challenging. This is because money and muscle power rule the roost here. It is where the DMK and family links came in handy. With the patronage Kalanithi received from the DMK's first family, Sun was able to quickly roll out Sumangali Cable Vision (SCV) across the state. At the time it operated from Anna Arivalyam, the DMK headquarters in central Chennai, and shared the party's logo of rising sun for its channels. Did Kalanithi succeed just because of his political links? A former associate who studied with him and did not want to be identified says if he was riding merely on the DMK's coat-tails, his success would have been restricted to Tamil Nadu. "He expanded all over south, buying channels in Telugu and Malayalam, offering a single platform for advertisers. He bought rights for most film libraries in the south before most people realised their value," he says. However, the managing director of a major competitor says Sun's success was mainly due to two reasons. First, the near monopoly in distribution through SCV initially and backing from the DMK. Second, the ruthless manner in which competitors were stifled. There have been reports of Sun using its distribution network to kill competition. For instance, if it felt that a channel was becoming a competition, it would lose audio when beamed into homes. Also, the cable TV operator would change the position of the channel at regular intervals. It helped that during the early phase of the company, the DMK (1996 to 2001 and 2006 to 2011) was in power in the state. Saxena, a one-time confidant and deputy COO of Sun Pictures, who has known Kalanithi for nearly three decades, says: "He is hardworking, not a party animal and is rarely seen at public events, preferring to keep a low profile. Yes, he has a temper, but only when crossed." When Murasoli Maran died in 2003, Karunanidhi said that he had lost his "conscience keeper". However, the Maran brothers decided to carry forward their father's political legacy. Kalanithi would look after the family's commercial interests while Dayanidhi would look after the political interests, says a former employee. In 2006, Sun TV decided to list and raised Rs 600 crore from the market. Just when everything seemed to be going well, the group faced its first big crisis. In 2007, Dinakaran, a newspaper owned by the Marans, published a survey promoting M.K. Stalin at the cost of his elder brother, M.K. Alagiri. This brought into the open the rift in the Karunanidhi family where a battle for succession was being fought. Karunanidhi evicted Sun TV from the party headquarters. Even Dayanidhi had to quit as Union telecom minister. Some of Karunanidhi's children also felt that the grand nephews had short-changed their grand uncle by buying their stake in Sun TV before the IPO for a "paltry price". Karunanidhi also ensured that Kalaignar TV, owned by his second wife and daughter from his third wife, was launched. Karunanidhi even had his government set up a state-owned cable services provider, Arasu Cable TV Corporation, to break SCV's hold on distribution. Sun was on the back foot. But an old relationship came to the rescue. Karunanidhi's daughter Selvi was married to Murasoli Selvam, an uncle of Kalanithi Maran. Selvam looked after Sun's operations in Karnataka and so was interested in settling the row. He ensured a patch-up. Dayanidhi rejoined the Cabinet and Arasu was rendered toothless. With the media business throwing up plenty of cash, Kalanithi made his first move outside media. The aviation sector is a tough nut to crack. So, it was a surprise when in January 2010 Kalanithi announced that he was acquiring a 37.75 per cent stake in low-cost carrier SpiceJet for Rs 750 crore. He eventually took this to 75 per cent and pumped in more than Rs1,500 crore. A senior executive of the Sun Group who claims to have advised against the move says, "The main business was throwing up so much money that he had to invest somewhere. He chose aviation." Kalanithi seemed to have turned around the airline in a year. However, the good times did not last. Five years later, he had to sell the business to its original promoters. The year 2011 brought a second wave of troubles for the brothers. Dayanidhi, now the Union textiles minister, had to resign after the CBI implicated him in the 2G spectrum scam. The CBI also filed a case against the brothers after an NRI tycoon, C. Sivasankaran, accused them of forcing him to sell Aircel telecom network to Maxis of Malaysia for an illegal gratification of Rs 700 crore. The CBI chargesheet said the money was routed as a share premium for investment in Sun Direct, the DTH arm of the Sun Group. Narayanan, the Group CFO, offers a detailed defence on behalf of the Marans (see interview). Dayanidhi was also accused of running a telecom exchange at the house he shared with his brother which provided high-speed connectivity to Sun Network, causing losses to BSNL. The brothers deny the charges. The MHA is believed to have used the above instances and Kalanithi's sympathies for the LTTE during his student days to argue for the ban. 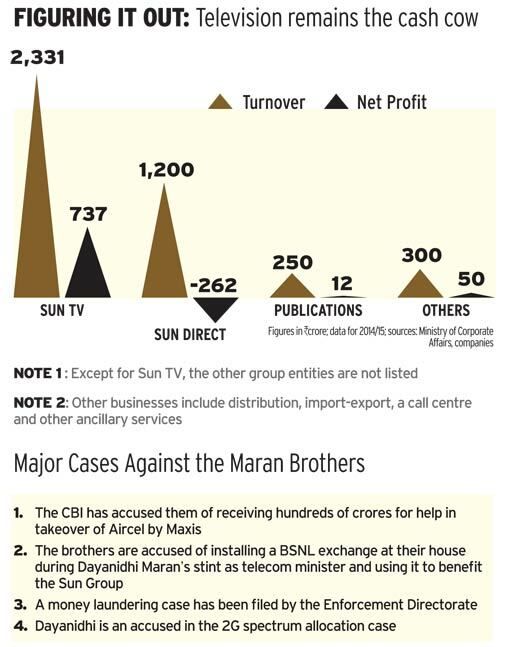 Narayanan, however, contends that these are just allegations and so cannot be used to revoke Sun's licences. With the DMK having no seat in the Lok Sabha and just four in the Rajya Sabha, the party is not in a position to help much. Also, with the BJP, which rules at the Centre, aligned with J. Jayalalithaa, its main rival, the pressure is unlikely to abate. But Narayanan says Sun will fight back. 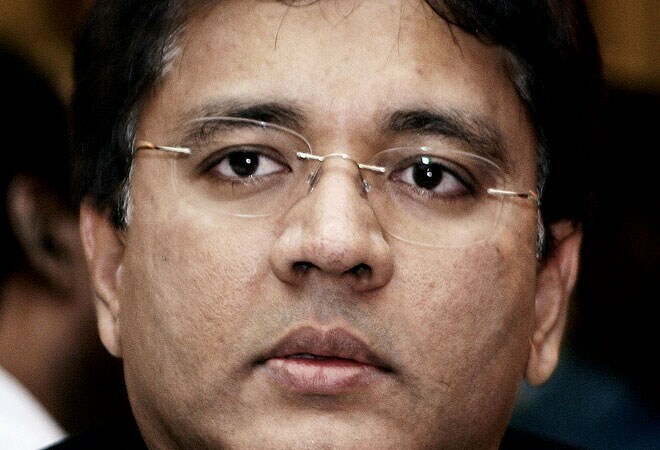 He says unlike SpiceJet, which was an acquisition, Kalanithi will never become a minority shareholder and there is no question of selling the network. However, the unfavourable political environment has meant that Sun has to supply its channels to Arasu after a year-long negotiation at a "substantial haircut", says Narayanan. "With state elections due in six months, if the DMK comes back to power, it will help them, otherwise things look tough. But Kalanithi will not give up without a fight. Those who live by the sword? ", says the managing director of a competitor. Kalanithi, though, is believed to be preparing for all eventualities. His wife Kavery is more actively involved in running the company even as his 22-year-old daughter, Kaviya, is getting trained at Sun Music. For the Marans, the political game is likely to decide Sun TV's fate. For Kalanithi, this means a fight to the finish.